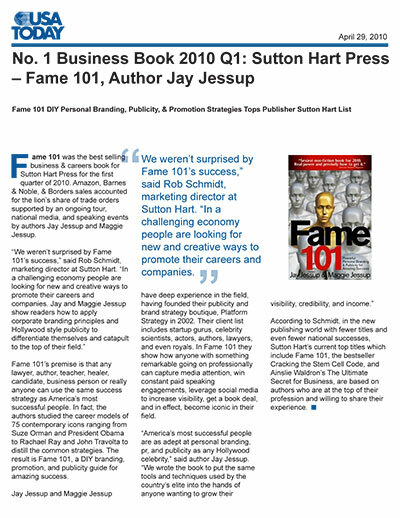 Fame 101 was the best selling business & careers book for Sutton Hart Press for the first quarter of 2010. Amazon, Barnes & Noble, & Borders sales accounted for the lion's share of trade orders supported by an ongoing tour, national media, and speaking events by authors Jay Jessup and Maggie Jessup. "We weren't surprised by Fame 101's success," said Rob Schmidt, marketing director at Sutton Hart. "In a challenging economy people are looking for new and creative ways to promote their careers and companies. Jay and Maggie Jessup show readers how to apply corporate branding principles and Hollywood style publicity to differentiate themselves and catapult to the top of their field." Fame 101's premise is that any lawyer, author, teacher, healer, candidate, business person or really anyone can use the same success strategy as America's most successful people. In fact, the authors studied the career models of 75 contemporary icons ranging from Suze Orman and President Obama to Rachael Ray and John Travolta to distill the common strategies. The result is Fame 101, a DIY branding, promotion, and publicity guide for amazing success. Jay Jessup and Maggie Jessup have deep experience in the field, having founded their publicity and brand strategy boutique, Platform Strategy in 2002.  Their client list includes startup gurus, celebrity scientists, actors, authors, lawyers, and even royals. 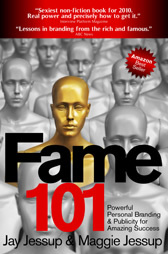 In Fame 101 they show how anyone with something remarkable going on professionally can capture media attention, win constant paid speaking engagements, leverage social media to increase visibility, get a book deal, and in effect, become iconic in their field. "America's most successful people are as adept at personal branding, pr, and publicity as any Hollywood celebrity," said author Jay Jessup. "We wrote the book to put the same tools and techniques used by the country's elite into the hands of anyone wanting to grow their visibility, credibility, and income." According to Schmidt, in the new publishing world with fewer titles and even fewer national successes, Sutton Hart's current top titles which include Fame 101, the bestseller Cracking the Stem Cell Code, and Ainslie Waldron's The Ultimate Secret for Business, are based on authors who are at the top of their profession and willing to share their experience.